We know ‘change’ is a paradox, as it is the one thing of which we can be truly certain. As change happens everyday in all our surroundings we endure by continuously adapting ourselves, and our belongings to our situation. In nature species rely on dynamic modification in form and size in order to reproduce, feed or protect themselves. The capacity to adapt is essential to continued survival. And so it is in our ‘man made’ artificial world. As practical experience shows us, many organisations that fail to adjust to ever changing business environments tend to disappear. Back in 1973, Victor Papanek and James Henessey had already prophesised the necessity for greater movement of people, suggesting that through our changing lifestyles we are all becoming nomadic. At Brimstones and Treacle we delight in their book ‘Nomadic Furniture’ in which they have attempted to fill a void by designing furniture that can be built yourself, bought or adapted by being easily constructed, but which also folds, stacks, inflates or knocks down, or else is disposable whilst being ecologically responsible. Creativity is nothing but combining existing knowledge in new and useful ways. In essence, the book is a manifesto for nomadic living, some ideas were new, some from cultures thousands of years old, but all are an attempt to enable us to have more by owning less, neatly encapsulating the need for elegant solutions for efficiency that enhance our lives on the move. If we return for a moment to first principles, the needs of ‘function’ and ‘social use’ provided for by Furniture is to serve as a means of keeping people and activities off the ground. Broadly speaking this furniture is nearly always moveable, but sometimes not without difficulty. On some occasions furniture is actually fixed, being mechanically attached to the floor, wall or ceiling, but conversely, some furniture typologies can be adjustable, designed to transform from one form into a different one. A great deal of this collapsible furniture has been designed with people on the move in mind. Historically, for example campaigning warlords and safari hunters each have commissioned furniture to suit their changing needs. 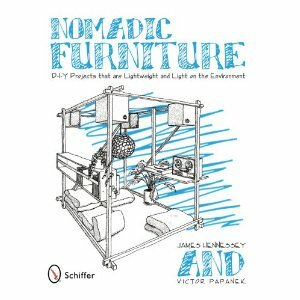 Mechanical linkages can allow furniture to become transformative machines for living. 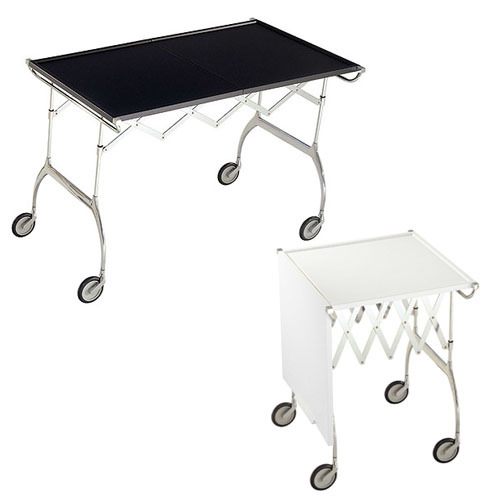 By adjusting into different forms, folding tables, butterfly tables and extending draw tables can be transformed from one state to another. The classic folding chair and the director’s chair are remarkably simple pieces that transform for use transport and storage. Since the whole idea of folding objects is to save space, the concept of collapsibility inevitably implies a measure of minimalism as embodied by the Pila chair designed by Giancarlo Piretti in 1969. Stools: Collapsible seating has been around for several millenia, first as a symbolic device of authority, later as an everyday tool. 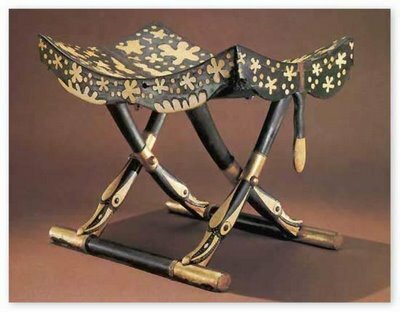 Egyptian dignitaries used collapsible stools in the second millenium BC. A folding stool, the sella curulis, was both the seat and the official symbol of the roman high magistrate. Later the faldistorum, the throne of a roman catholic bishop, was a collapsible too. 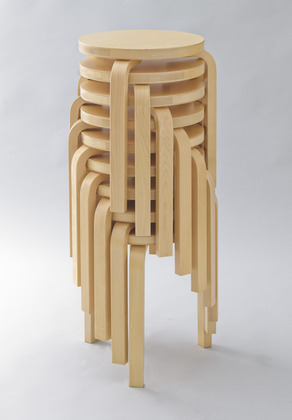 Improbably high stacks are possible with Alvar Aalto stools. Today, a collapsible stool represents a design challenge, perhaps being a test of ingenuity over a direct response to a market demand. 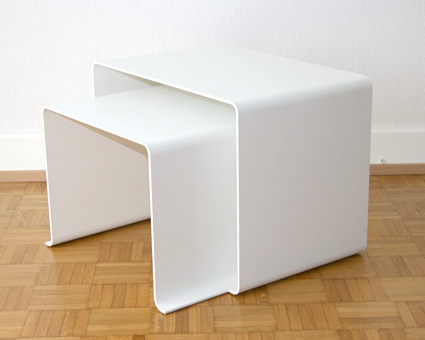 Some of the most elegant, if not necessarily the most purposeful examples of modern Danish design are collapsible stools. Chairs: Chairs as you would expect are defined by their prime function, which is to serve as a place to sit, but there are other functions they might be called upon to provide. Man made body supports such as the stool or the chair include elevated platforms and raised surfaces for sitting and resting. However squatting is considered by many to be the first and most natural means of sitting and is especially prevalent in nomadic societies. Squatting is physiologically healthy and doesn’t rely on the use of or need for chairs. But most people in western society have cultural preferences for chairs. They desire the comfort and posture achieved by sitting. Stacking and Folding chairs address the additional need for space-saving and portability. 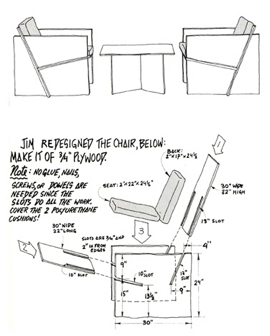 Collapsible furniture includes a number of generic chair types. 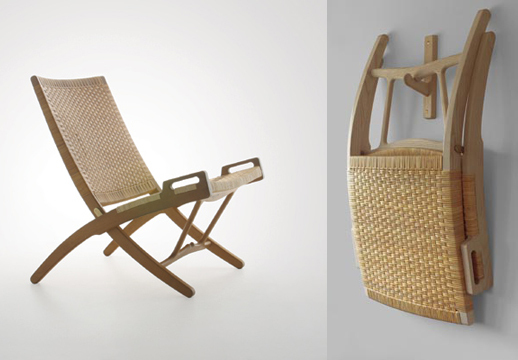 The director’s chair, the butterfly chair, the safari chair and the deck chair are all examples of familiar designs used as rich material for upgrading by contemporary designers seeking acceptance. Most collapsible chairs fold flat for storage. 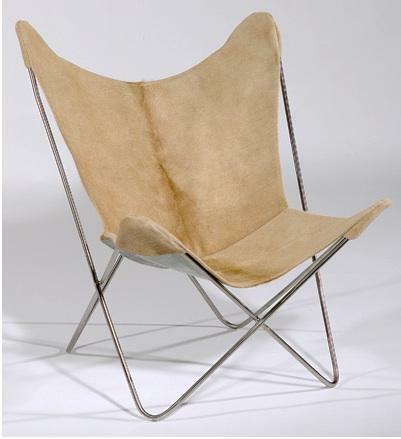 Others like Kaare Klint’s Safari chair, are assembled and dismantled requiring more effort. The collective collapsibility of stacking chairs acquire the significant function of nesting. The Safari chair, is a generic camp furniture type originating from the 19th Century. It falls behind scissor type chairs as it does not fold as such, instead it dismantles which can be time consuming. 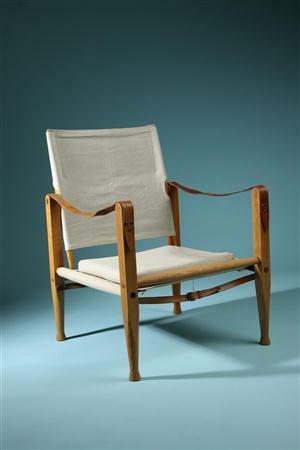 In 1933 Kaare Klint designed this example. 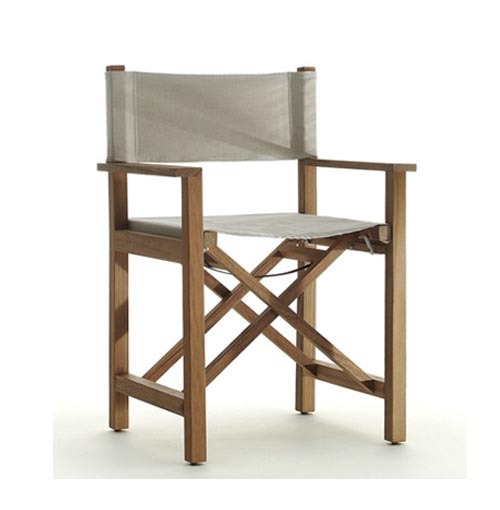 The director’s chair is a scissor frame collapsible and folds side to side. Probably used as campaign furniture in the American Civil War the Director’s chair can be traced back to the 18th century. Hans Wegner’s collapsible chair in which seat, back and legs form a single X that is pleasing when in full but also as an adornment to a room when hung on the wall. 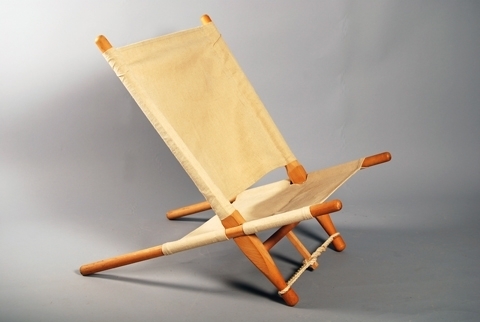 Ole Gierløv Knudsen’s Bucksaw chair of 1966, so named because it is held together by the same principle. The butterfly chair was invented around 1870. The frame of the original dismantles whereas contemporary versions simply fold. As Arne Jacobsen’s 3107 chair from 1954 proves a collection can do what the individual number cannot: Stacking chairs are collective collapsibles. 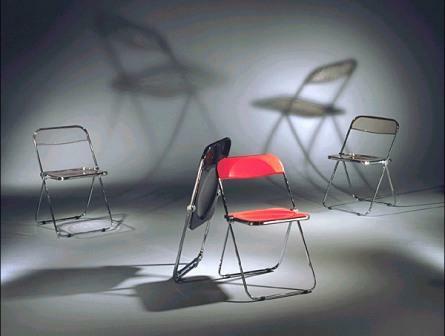 Individual chairs do not fold, but two chairs stacked together occupy far less than twice the practical space of one. Beds, Sofabeds and Sofas: Stools and chairs are the most numerous category of collapsible furniture. This may be owing to the human need, or entirely because their form encourages it. Other forms of collapsible furniture do exist, with many furnishings designed to serve more than one purpose, especially in small spaces where efficiency and economy are required. The futon is the Japanese bedding system that includes shikibuton floor mat on which a person sleeps, and the kakebuton, that covers the body. It’s portability is an important feature as it allows it to be stored when not in use offering space saving in the traditional Japanese living space which tend to be compact. Western societies utilise the adjustable wooden frames to help place the futon in either a sitting or sleeping position. Guest beds are a unusual category, -with complex folding mechanisms many are a cause of slapstick comedy, conjuring memories of mythological greek torturer Procrustes’ gruesome tactic of collapsing the person to fit the furniture. Now inflatable collapsibles compete with preceding designs such as the concertina bed. 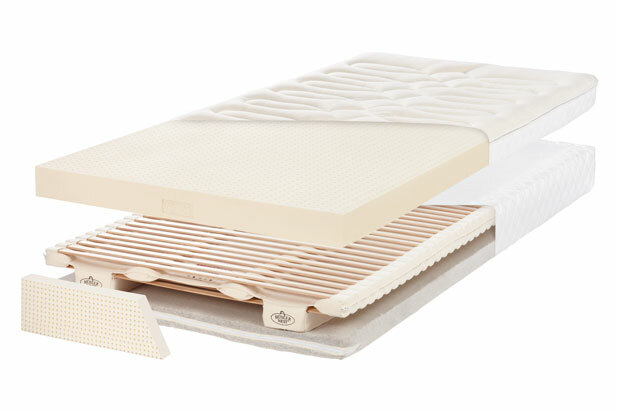 Inflatable air matresses are filled internally and covered externally. 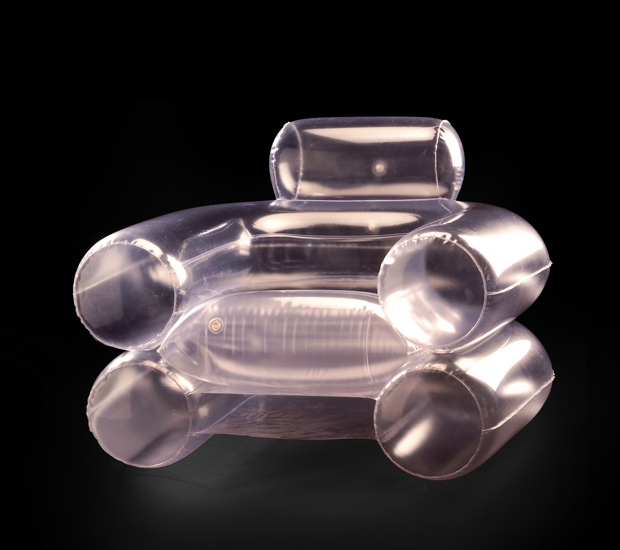 Such inflated pieces of furniture are designed for temporary uses and can be made compact for storage or transport. 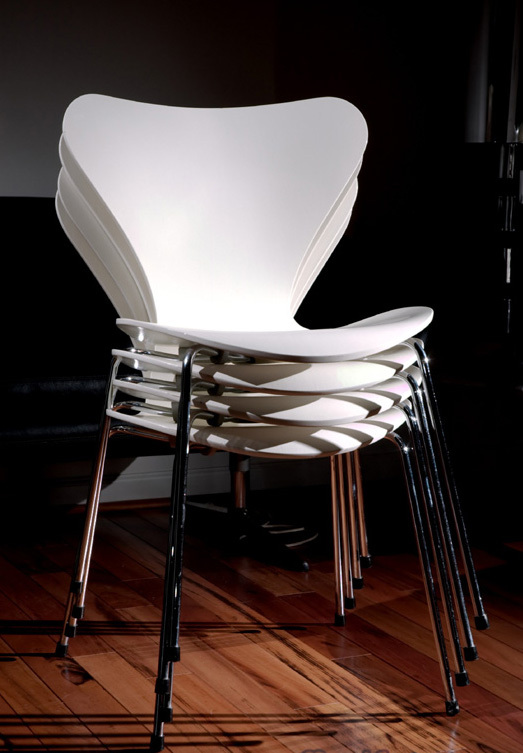 As much a visual joke as a functioning collapsible, the ‘Blow’ chair (1967) designed by Jonathan de Pas, Donato d’Urbino , Paolo Lomazzi and Massimo Scolari for Zanotta, was one of the first commercially produced furniture products to rely upon a thin membrane of PVC, low voltage welded seams and air. A variety of ‘hidden by day’ sleeping furniture is the sofabed, which folds up as a sofa and folds out to double up as a bed. 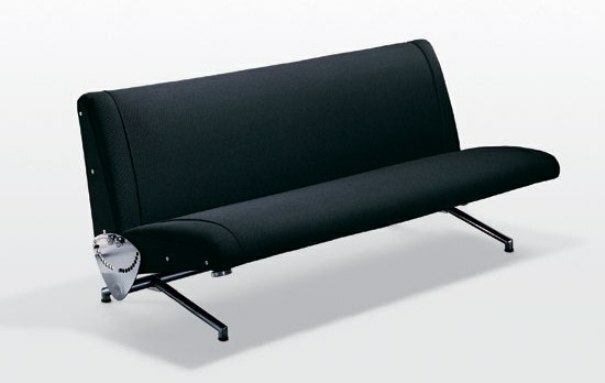 Generally ugly and awkward to lie on, Osvaldo Borsini’s 1954 is a noteworthy exception for both aesthetic appeal and functionality. Tables: Two states must be met before collapsible objects are designed and manufactured: there must be a need and there must be a technical possibility. 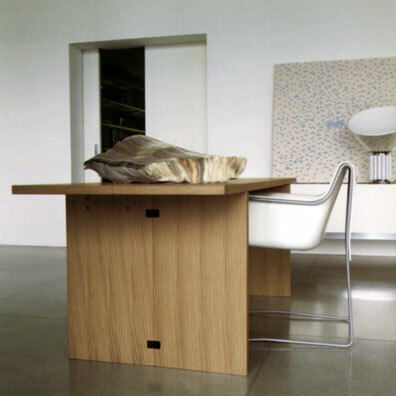 Tables answer both these conditions: a considerable number of us have an occasional need for the elevated surface space of a table: and collapsibility is also technically achievable. There are two modes of collapsibility of tables. Some are dismantlable and fold away completely; others expand and reduce partially by means of extension plates. Charles Rennie Mackintosh. Drop leaf table 1918. 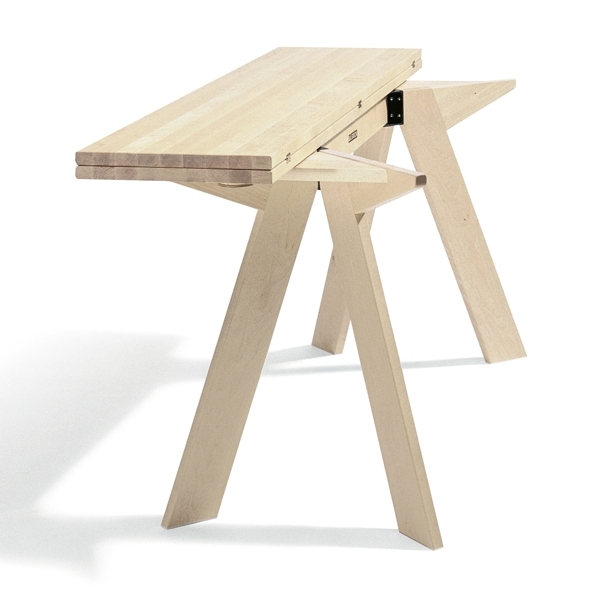 Battista by Antonio Citterio and Oliver Löw, is an adjustable concertina collapsible table. La Barca by Piero de Martini is a halfway solution. 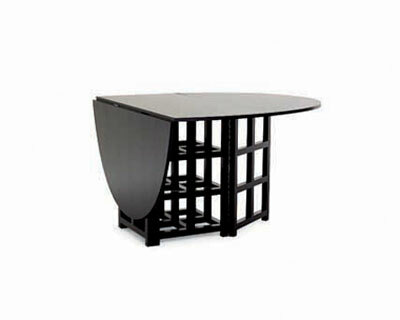 Both top and base are hinged allowing the table to halve in size. Simsalabim by Börge Lindau. One table folds in half, allowing two tables to occupy the same space as one. There are also tables that collapse collectively. Some of uniform size stack, others in sets of decreasing size nest. This example is designed by Dieter Rams. Storage: Collapsible storage furniture is a thinly populated category. This is rational, as the purpose of storage furniture is to hold things – unlike stools, chairs, beds and sofas, which hold bodies. 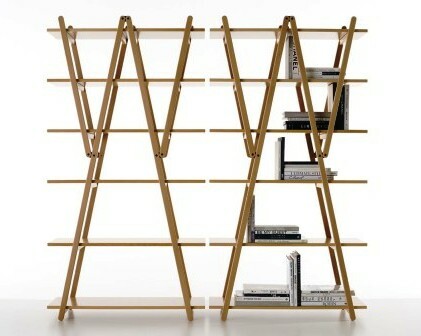 Vico Magistretti designed the Nuvola Rossa shelving system in 1977. Our need for containers for belongings is not as flexible as the requirement for body furniture. We simply do not choose to fold down a cupboard. Where would we store its contents if we did? Professional travellers have a nomadic tendency to travel light, stowing their belongings in sizeable suitcases which function as furniture. All these pieces of transfigurable furniture are vital tools to extend our natural capacities, being a succinct example of our adaption to the ever changing world. The requirement for collapsibility in furniture is shaped by either an intermittent need or a changing location of the need. ‘Mobilia’, which is the latin name for furniture expresses it’s mobile character, -which is significantly improved upon by collapsibility.